El Portal Luxury Inn ~ Sedona’s Moonlight Walk September 23rd & 24th! At El Portal Sedona Hotel we know Sedona. We love to help you plan your day, your excursions, your adventures! The staff at El Portal can make hiking and sightseeing recommendations, and arrange picnics, rafting or helicopter excursions, and that’s just for starters. Owner Steve Segner is an avid hiker and outdoorsman, and is well versed in what might be an overwhelming choice of trails available to visitors. He can point guests in the right direction, whether it’s a gentle sunrise stroll through red rock vistas, or an adrenaline-pumping rock scaling adventure. One unique adventure is the Moonlight Walk. The Moonlight Walk at Red Rock State Park is an unforgettable experience! This amazing hike includes a naturalist-led interpretive program on the Park’s beautiful trails. The hike lasts about two hours, is approximately two miles long, and climbs an elevation of 200-250 feet. The hike leaves promptly at 6pm (from the Visitor’s Center), no late arrivals will be able to join the hike. We suggest you wear suitable clothing and shoes (be prepared for cooler nights), bring water, a flashlight, and insect spray. Please call 928-282-6907 for reservations, fees and additional information. Red Rock State Park is located at 4050 Lower Red Rock Loop Road, in Sedona. Imagine the beautiful sunset and moonrise from a precipice, and the return hike by the light of the moon – breathtaking! El Portal is only 15 minutes from the park. We’d love you to take this incredible journey through the red rocks, and come “home” to El Portal. 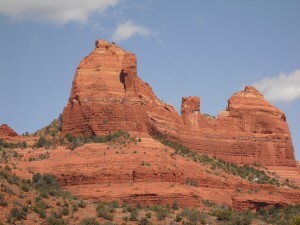 Don’t forget the Sedona WineFest is this weekend, September 25th & 26th! Call 1-800-313-0017 for your reservation and fall specials!